Creating status table with free templates and examples. Making status table has never been easier. A state table is a table which shows what state will move to, based on the current state and other inputs. A state table is essentially a truth table in which some of the inputs are the current state, and the outputs include the next state. There are generally two forms of state table: vertical dimension state table and or horizontal one. 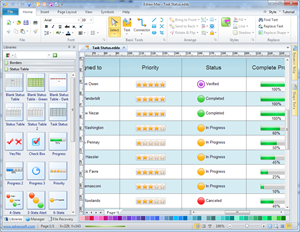 You can easily create a status table with Edraw software which can clearly show the status of your work progress, job schedule or project process, etc. With Edraw's automated Status Table software, you can easily create a great-looking and professional Status Table diagram. It offers a wide range of pre-drawn symbols and shapes for you to choose, and through the automated tools, you can simply customize your diagram. The finished chart can be exported to PDF, PowerPoint, Word and Graphics formats. 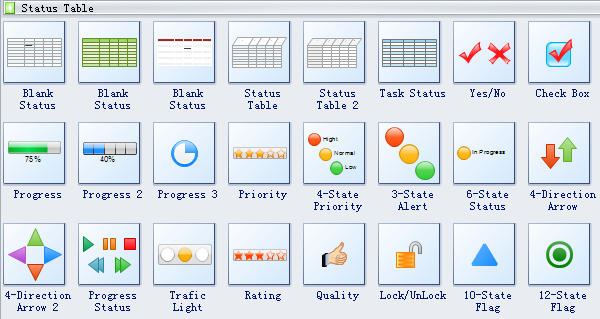 Edraw status table templates provide you many special shapes used in the status table, blank status, status table, task status, check box, progress, priority, 4-state priority, 3-state alert, 6-state status, 4-drection arrow, progress status, traffic light, and rating, etc. 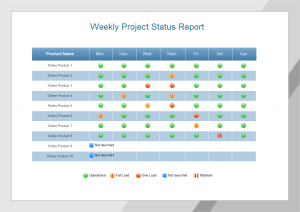 A weekly project status report template is quite helpful in scheduling projects and management efficiently.